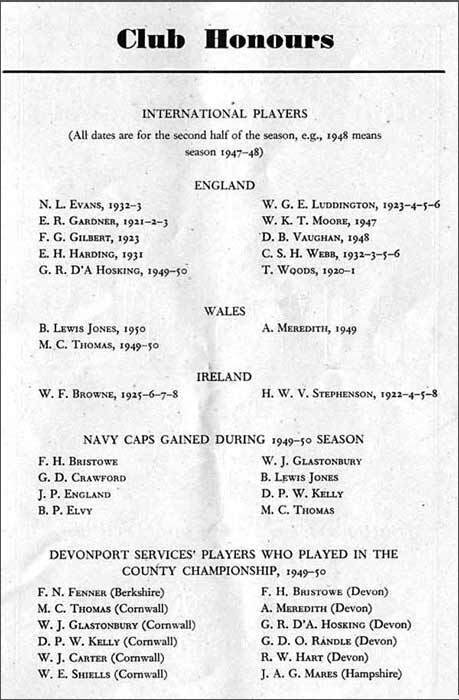 (The Rectory Ground, the home of Devonport Services RFC, was out of action for two years between 1948 and 1950 while repairs were carried out. 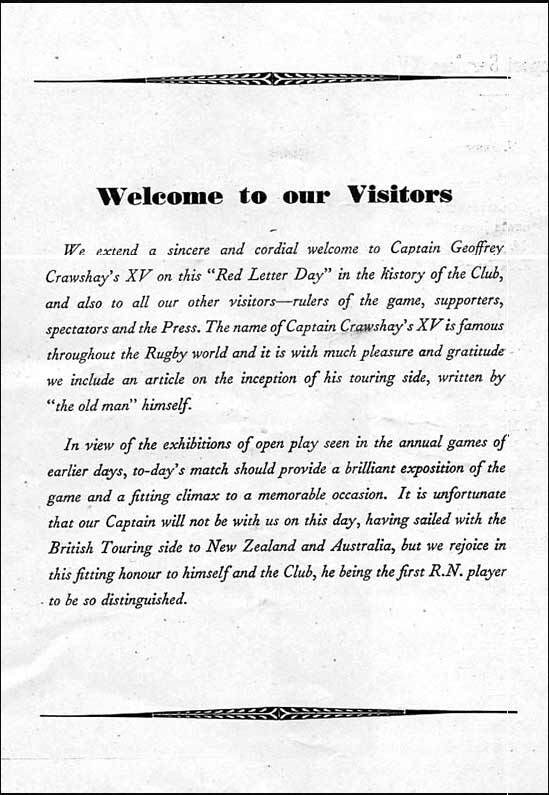 When the ground and club reopened in April 1950 a souvenir programme was published. 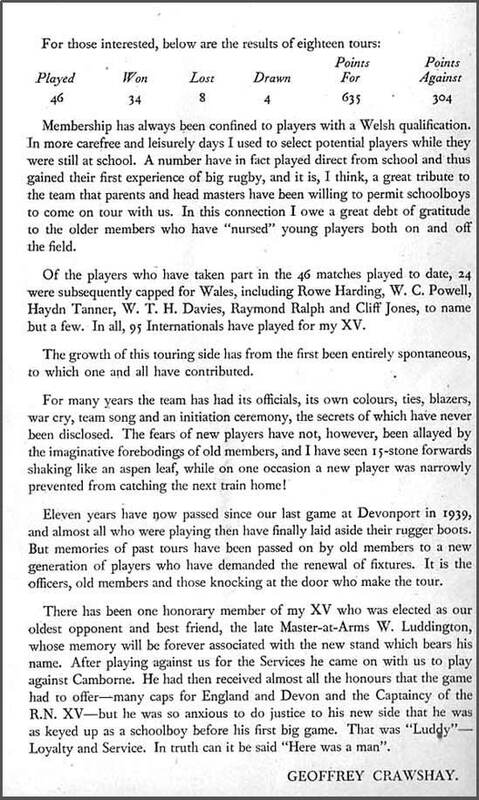 Below is a transcription of the history article from that programme; remaining pages from the programme are in the images underneath.) 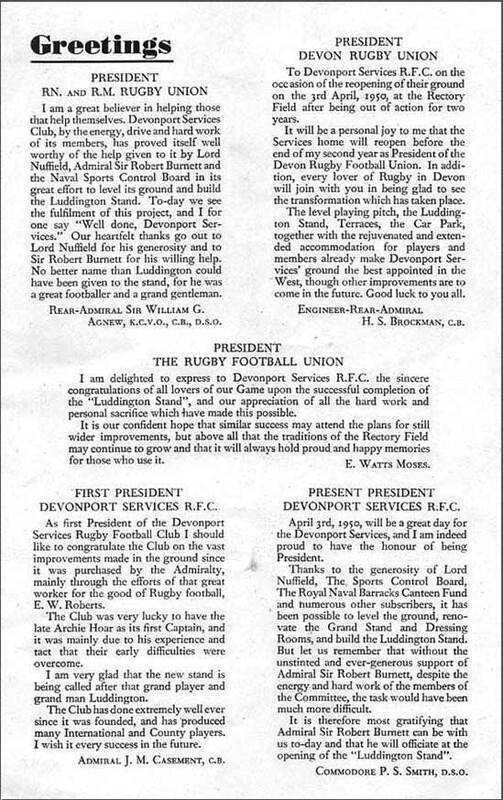 See Devonport Services RFC for wider information on Devonport Services and the Devonport Rectory Ground. The Rectory Ground as we know it to-day is referred to in the deeds as: "All that piece of parcel of land (part of the glebe land belonging to the said Rectory) situated-in the parish of Stoke Damarell, now Devonport in the County of Devon and containing four acres, two roods, and twenty-three perches or thereabouts and bordered on the North by Church Path on the East by the Military Hospital on the West by the Old Rectory ground and on the South by Stonehouse Creek and the foreshore there." By a lease dated 24th June, 1896, between the Rev. Stewart Gordon Ponsonby, Rector (the lessor), The Lord St. Levan (patron), the Ecclesiastical Com¬missioners and The Albion Football and Rectory Recreation Ground Company Limited (the lessees), the Rectory Field was leased to the Albion Football Club for 14 years at a rent of £200 per annum, and a premium of £200. The lessees were also to pay all taxes and to erect and keep in repair "a good substantial unclimbable wall or fence along the whole of the South-east side". No pavilions or other structures were allowed to be erected without the approval of the lessor. The club was to permit the lessor and his assistant clergy free entrance to the field and pavilions while any "sports game" or pastimes were being played or in progress. A second lease on the same terms as the first was signed on 4th May, 1911. On 14th June 1920, the land was sold for £6,500 “to the use of the Admiralty and their Successors in trust for His Majesty King George V, his Heirs and Successors for the Public service”. 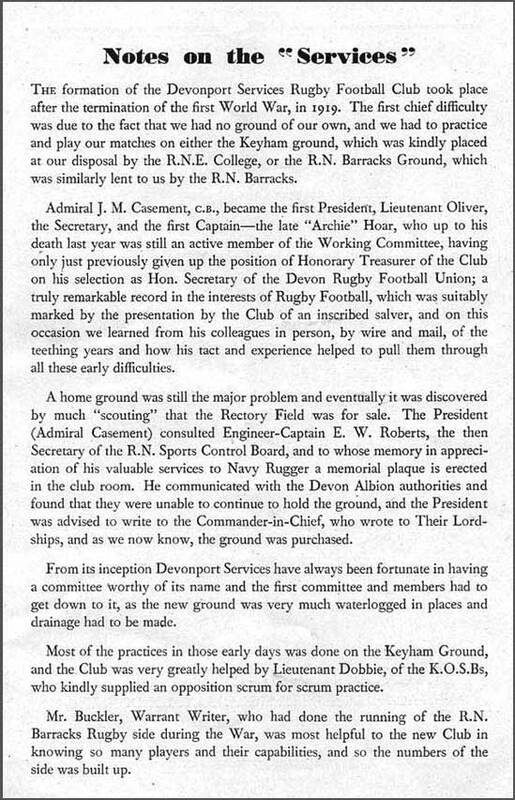 On the 13th February, 1928, the Rectory Field was “conveyed” from the “Lords Commissioners for Executing the Office of Lord High Admiral of the United Kingdom of Great Britain and Ireland” to the Trustees of the Royal Navy and Royal Marines Sports Control Board, to which the ground still belongs and is rented by Devonport Services Rugby Football Club, whose headquarters it has been since. After the last war we found ourselves practically minus the stand, largely destroyed by fire in the blitz, and in 1947 only one small section accommodating 50 people was considered safe. It was decided to reconstruct it entirely and at the same time perpetuate the memory of the late M.A.A. “Bill Luddington” (our Captain in 1925-26 and 1926-27, Royal Navy Captain in 1926 and 13 English caps), and all Rugger players of the West-country Division who made the supreme sacrifice. A world-wide appeal to the Fleet and others was made with much success, one notable gift being £1,000 from the R.N. Barracks, Devonport, Canteen Committee. However, the Club committee, led by their energetic Secretary, on fuller consideration agreed to change their plans, and it was decided to terrace the opposite side as far as funds would permit, and that when conditions permitted to complete and cover—this to be known as the “Luddington Memorial Stand”, in accordance with the wishes of ratings of Devonport Port Division, to whom “Ludds” had a special link, for he was the only rating ever to be honoured with the captaincy of the Royal Navy XV. On March, 1947, the Sports Control Board were first approached concerning the levelling of the ground. It was agreed that this was a good thing, but must be left to the Club. As all old players and supporters will appreciate who remember the famous “Rectory Slope”, there was a 12-foot drop in the ground. In April, 1947, the Commander-in-Chief (Admiral Sir Pridham-Whippell) was approached, and our ideas and woes were placed before him and his blessing and co-operation were readily given. However, before work had started he had been relieved, and Admiral Sir Robert Burnett joined into the fray, finding a grant of £1,500 from the Port Fund, and he has been backing our efforts ever since. The Club appreciated that funds in hand were insufficient when such matters as repairing walls and drainage were taken into consideration. However, after much deliberation, the Club accepted the proposed contracts for levelling at a cost of over £2,000, and that of Messrs. Suttons of Reading for cultivation and sowing under the supervision of their foreman. 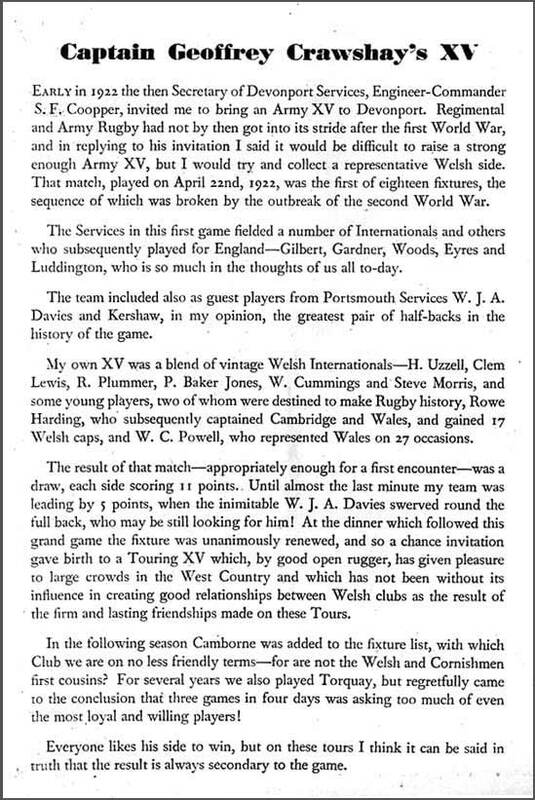 It was also agreed for all games after 3rd April, 1947, and all the following season to be played “away” except for a few where the R.N.E. College ground could be borrowed, when it was immediately lent. It was hoped that the ground would be ready for play in the autumn of 1949. Work eventually started on the ground on 21st April, 1948—Bulldozers were at work! Trouble and setbacks soon reared their ugly heads in this big undertaking—a bad patch of rock and shale of 9-feet depth was encountered, shortages of labour and materials for building purposes soon made themselves felt, and despite all coercion and the manual help of club members directed by the then President of the Club (Commodore S.M. Raw, C.B.E.) and the Maintenance Commander (Commander J.H. Wood, R.N.) we were halted and delayed by bad weather. The ground had to be left until March, 1949, before it was possible to cultivate, grade and sow. Again another season of almost continuous away matches cheerfully accepted by the players and officials. But meanwhile what was going on behind the scenes. None of the great sum of money from the Nuffield Trust and local funds which were earmarked for the financing of the levelling of the ground and the building of the terraces could be diverted to the problem of the burnt-out stand, which was a club responsibility. The most damaged part of the stand was cannibalized and the salvaged materials were used to patch up the remainder of the stand, so that now we can accommodate 1,200 spectators instead of 50. The repaired portion of the stand has been given a life of at least ten years, by which time we hope conditions in the building trades, the housing situation in Plymouth, and the availability of permits will allow us to build a new stand for which the Nuffield Trust and local funds have promised the money. In addition to the seating accommodation word must be said of the improvements made “down below”. New separate changing and bathrooms have been built for visiting and home teams—new boilers installed—a referees’ changing and bathroom—am enlarged club bar involving the sacrifice of the Committee room, and a tea-room complete with a modern Kitchen. (Standby wives and sweethearts next season!) The money and work came from the slender resources of the Club and the truly well-named “Working Committee”, and from voluntary effort on the part of members in organizing dances and other social events and prize draws. The painting of the stand would have been a very costly item far beyond our means had it not been for the kindness and goodness of the Indestructible Paint Co. Ltd., of Curzon Street, London, in supplying us with paint at much below cost price. We are deeply grateful to this company for their help and interest; as we are to all those local firms and other supporters who so generously gave us prizes to be competed for in the “draws”. Here then we present to you the renovated Rectory Field, but we have not finished yet—the “Twickenham of the West”, as it has been referred to, is not a dream, but is materialising, and what better opening match could be have than “the man in the old green cloak” and his merry men. 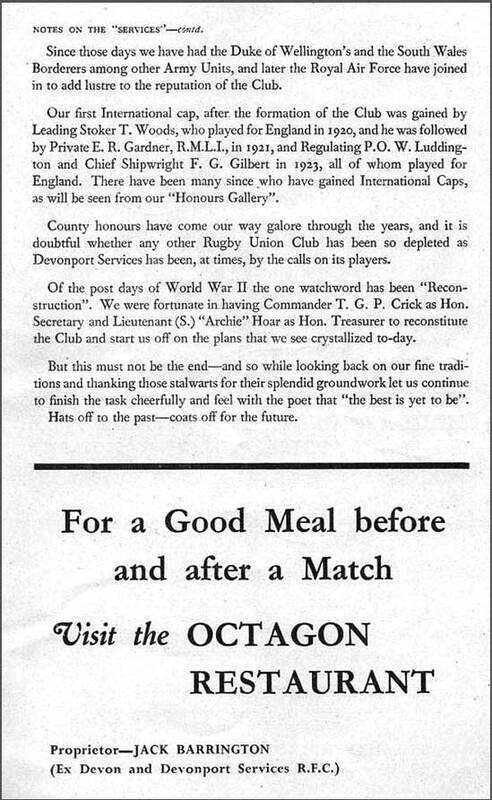 Images of the 1950 programme.